Adak is located in the Andreanof Islands, 1,300 miles southwest of Anchorage and 350 miles west of Unalaska/Dutch Harbor, in the Aleutian Island Chain. Flight time to Anchorage is three hours. 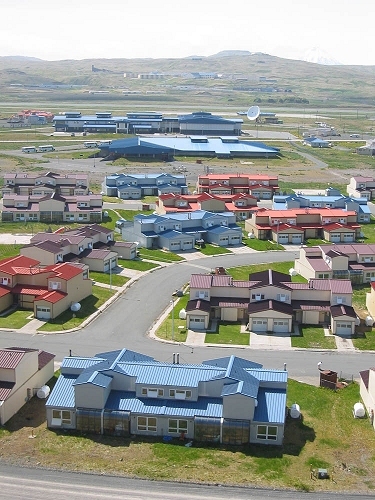 Adak is the southern-most community in Alaska, on the latitude of Vancouver Island in Canada. It lies at approximately 51° 45' N Latitude, 176° 45' W Longitude (Sec. 10, T096S, R195W, Seward Meridian). The community is located in the Aleutian Islands Recording District. The area encompasses 122 sq. miles of land and 5 sq. miles of water. The Aleutian Islands were historically occupied by Aleuts. The once heavily-populated island filled with many Aleut villages was eventually abandoned in the early 1800s as the Aleut hunters followed the Russian fur trade Eastward and famine set in on the Andreanof Island group. However, they continued to actively hunt and fish around the island over years, until World War II broke out. Adak was developed as a Naval Air Station after the War, playing an important role during the Cold War as a submarine surveillance center. Large earthquakes rocked the Island in 1957, 1964 and 1977. At its peak, the station housed 6,000 naval personnel and their families. In 1994, severe cut-backs occurred, and family housing and schools were closed. The station officially closed on March 31, 1997, and currently houses approximately 30 Navy personnel and 200 civilian caretakers. Space Mark, Inc., a subsidiary of The Aleut Corporation, is the contracted caretaker of the Adak facilities while environmental remedial work is being completed. Adak Reuse Corporation, the designated local reuse authority, is coordinating and implementing economic adjustment efforts to make Adak a viable economic center of commercial activities. The community has petitioned the Local Boundary Commission for incorporation as a second class city.